Smashing tile, ripping down wallpaper, tearing out sinks . 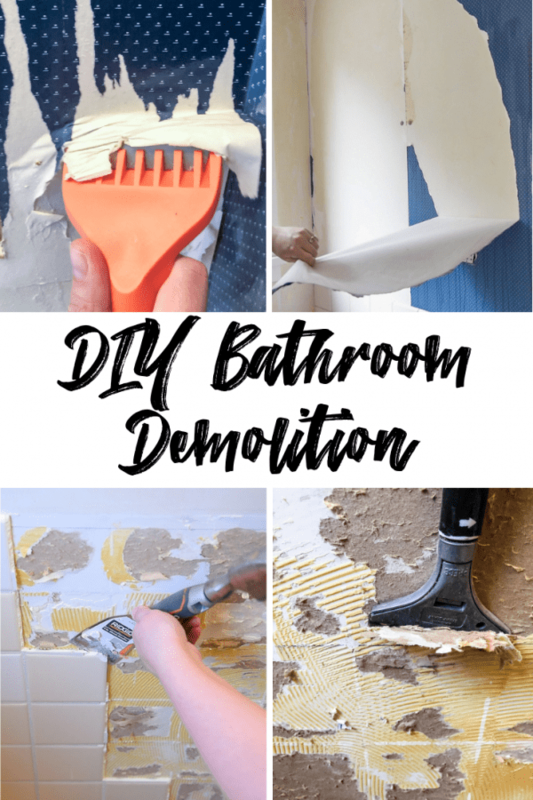 . . DIY bathroom demolition can be fun, but it’s a lot of hard work! 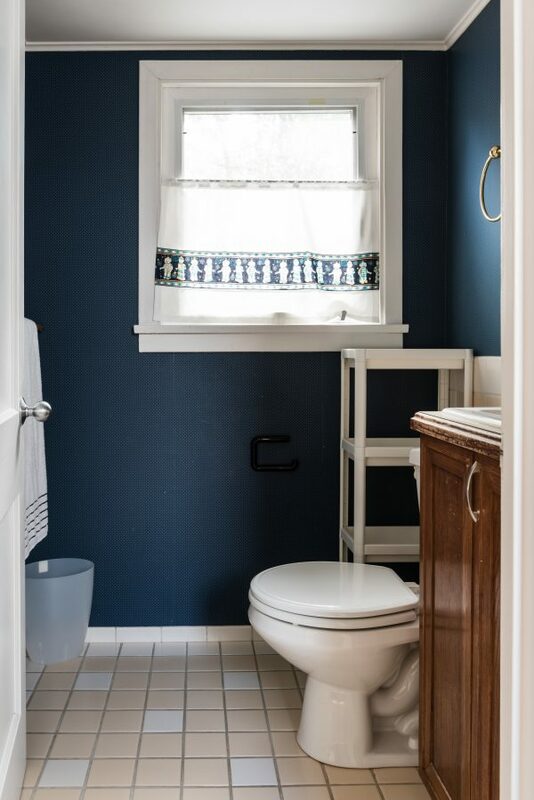 Get my tips and tricks, and check out my half bath makeover progress! 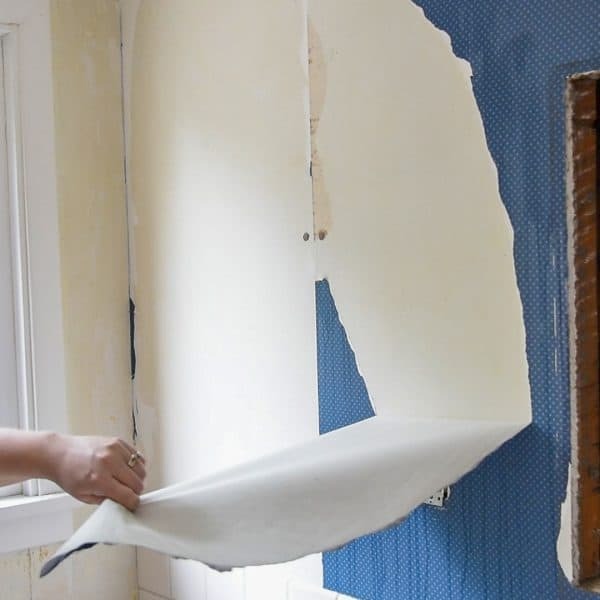 Bathroom demolition is the most fun and the most exhausting part of any renovation. There’s nothing like starting with a clean slate! 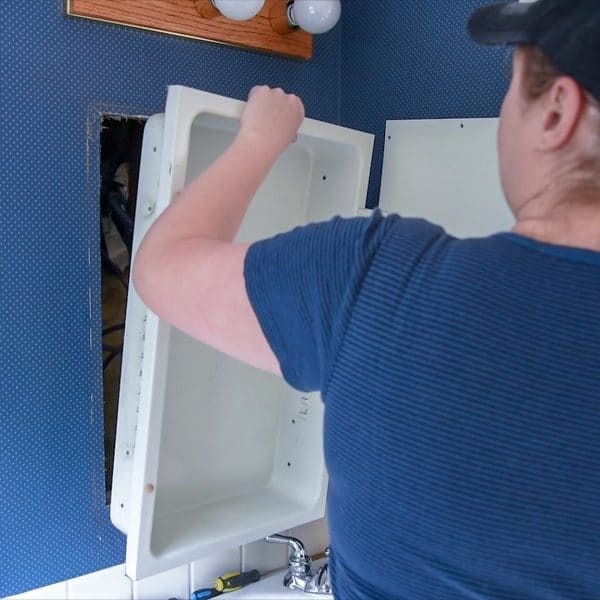 This week, I removed all the wallpaper and wall tile, and tore out the old vanity and medicine cabinet. It’s looking better already! 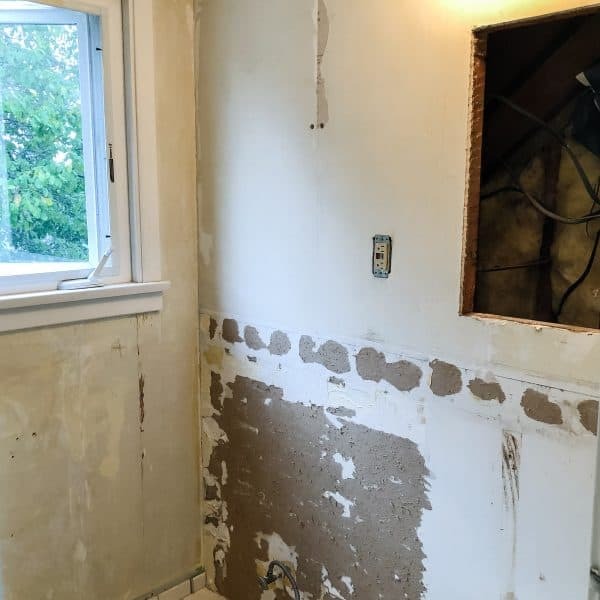 This tiny half bath was much easier to rip apart than my last bathroom demolition . 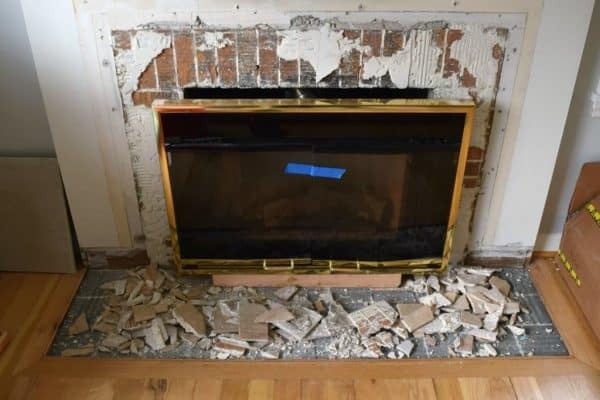 . .
or even my fireplace demolition! I don’t know if I’m getting better at wielding a hammer and chisel, or if this project is just easier than I expected. Either way, I’m relieved all the ugly is gone! Obviously, I’ve got some cleaning up to do before I can make this space beautiful. But, let’s check out my progress so far! I’ve hung textured wallpaper before, but didn’t have any experience taking it down. As usual, I researched the heck out of the process first. 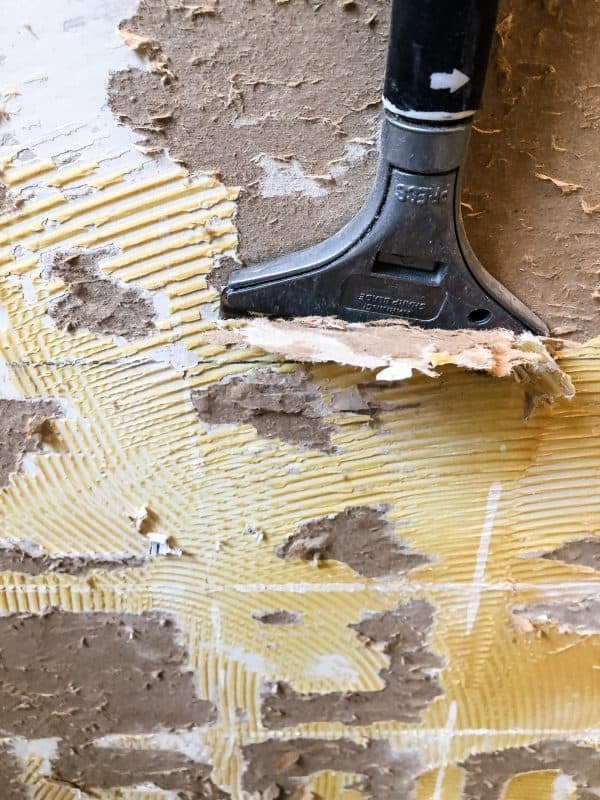 There are plenty of ways to tackle removing wallpaper: steaming, scoring and scraping, and lots of chemical and homemade sprays. 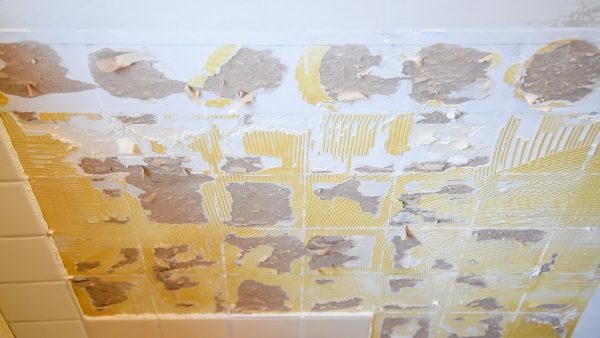 The wallpaper in our half bath feels very paper-y, so I thought the score – spray – scrape method would work best. 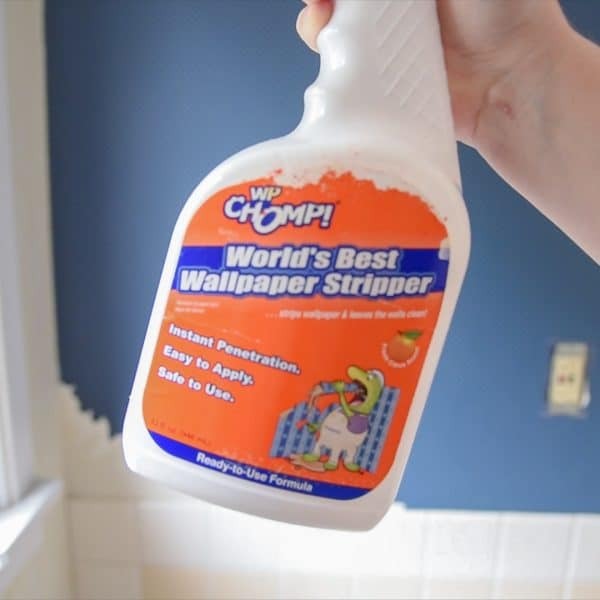 I read all the reviews, and decided to try the WP Chomp wallpaper removal tools. I started by removing all the fixtures from the walls. After I took the heating vent cover off, I noticed that the excess wallpaper was folded into it. Just out of curiosity, I gave it a tug . . .
Well, that was easy! I thought maybe the heat from the vent loosened the glue over the years. After reading all the horror stories about removing wallpaper, there’s no way the rest of the wall will go that smoothly, right? The whole bathroom was wallpaper free in less than two hours! I don’t know how I managed to win the wallpaper removal lottery, but I’ll take it! There were a few stubborn spots, especially at the seams. I sprayed the wallpaper remover on those areas and let it sit for a few minutes. Then I used the wallpaper scraping tool to pull up a corner, and peeled the whole thing off in one rip! There were a few spots where the paper backing stuck to the wall, but a few sprays and a quick scrape turned them to mush. So, this isn’t much of a tutorial. 🙂 But let this be a lesson to you . 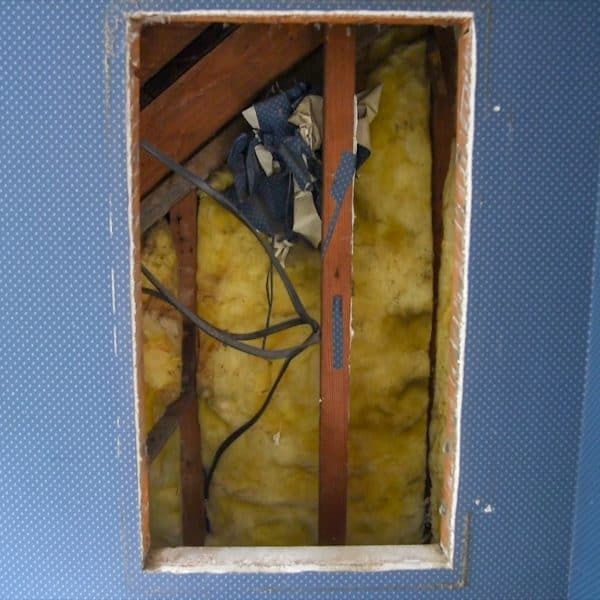 . . don’t be scared to try your own home improvement projects! 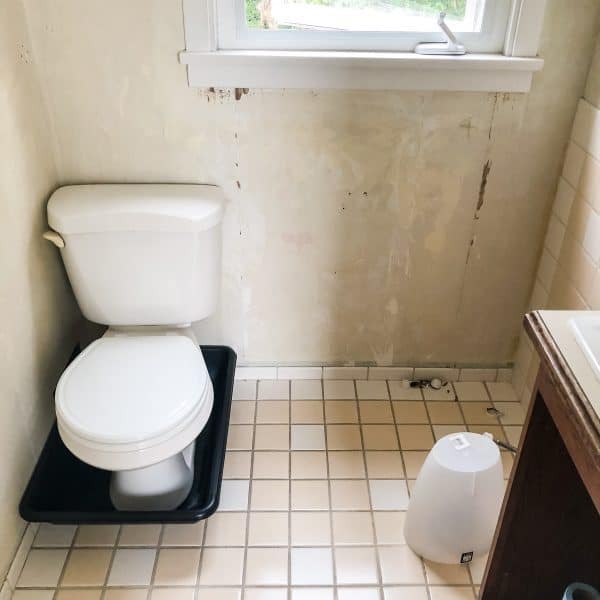 I dreaded remodeling this bathroom for YEARS because I was so worried about removing the wallpaper. But in the end, it was the easiest part of this whole project! But look at it from the inside. 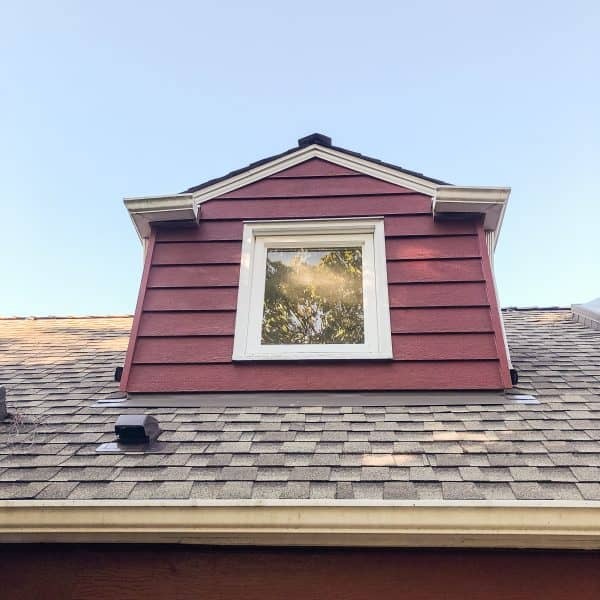 See how the window isn’t centered on the back wall? Why is the right side pushed so far in? What’s it hiding . . . treasure? Dead bodies? Hm, maybe I don’t want to know! I needed to remove the medicine cabinet so it could be positioned higher on the wall. It’s so low, you can’t see the top of your head in the mirror! This was my chance to take a peek behind the wall! It was a pretty simple process of just removing lots of screws. 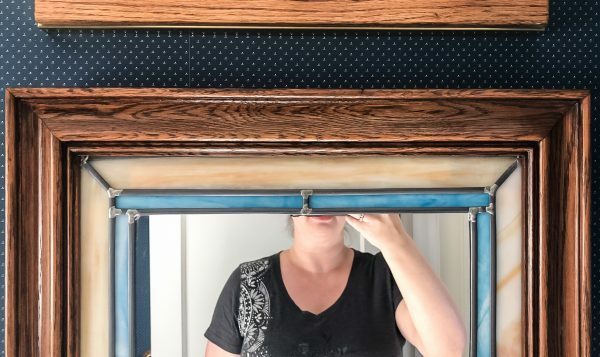 First, the ones on the medicine cabinet door that held the mirror to the hinged flap. Then the screws on the inside (which were a combination of Philips head and flat head screws, grrr). Inside was . . . nothing! Just a wadded up ball of wallpaper stuffed between the studs and about 8 inches of open space. So weird! 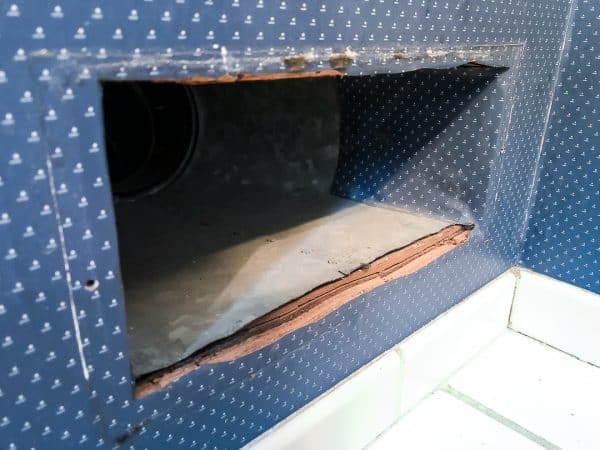 I have to do a bit more investigating to see if I can remove the cross brace at the top of the hole and move the medicine cabinet up a few inches. If not, I’ll just drywall over it and hang a mirror instead. I took the vanity doors off first to give myself more room to work. The hinges will be saved for a future project, but the rest of the cabinet isn’t really salvageable. 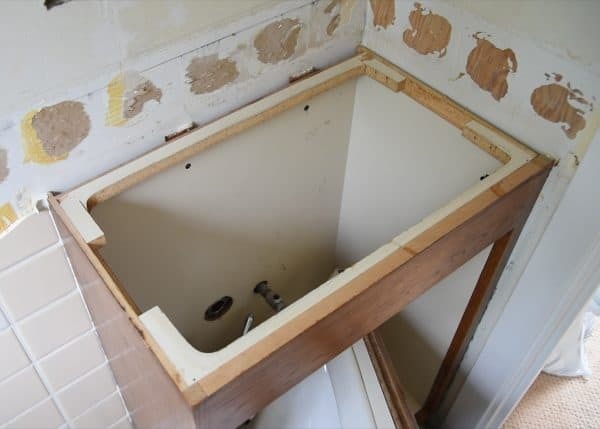 After disconnecting the water and drain pipe, I unscrewed the sink top from the base of the vanity. The wall tiles were installed around the top, so I pried them off first. The countertop and sink are so small, I had no problem pulling the whole thing off myself! 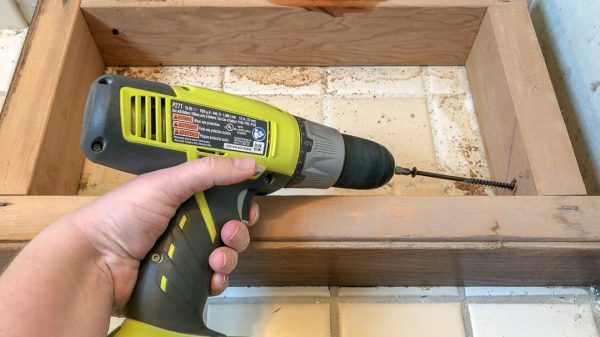 The vanity base was held to the wall with these insanely long screws. This thing wasn’t going anywhere without a fight! I was relieved to see that the tile extended all the way under the vanity to the wall. The new vanity has feet instead of a solid base, and I was worried that there was just a plywood floor underneath. Whew! 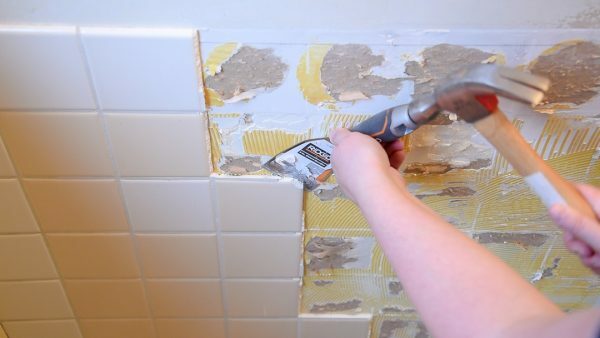 For the final stage of this DIY bathroom demolition, I tackled the wall tile. Luckily, there isn’t much! But it’s mostly behind the toilet, so that needed to be moved. Dropping the toilet into a mortar mixing tub keeps all the grossness contained, and makes it easier to move around. I can just slide it out into the hall when I need more space! A small plastic trash can is placed upside down over the hole in the floor. This prevents any gases from escaping into the room, and prevents me from accidentally touching the germ-infested toilet ring! Finally, it’s smashing time! Even though this entire wall will be covered with new tile, I tried not to damage the wall too much. Sometimes that’s easier said than done! Armed with my trusty chisel scraper and a hammer, I got to work. 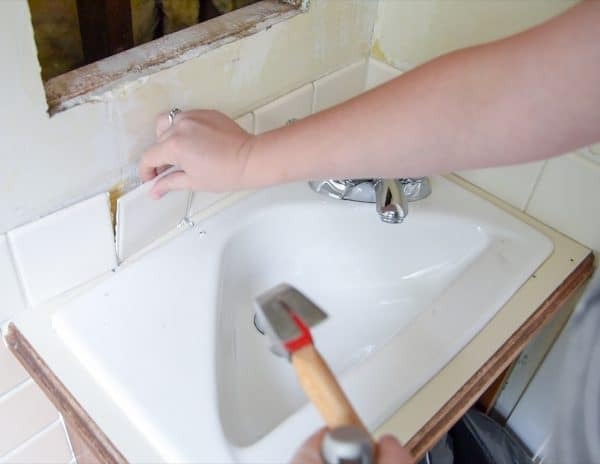 Just place the chisel scraper along the edge of the tile and give it a few taps with the hammer. With any luck, the tile will fall off cleanly from the wall! These popped off pretty easily, but there’s still a mess of adhesive left on the wall. 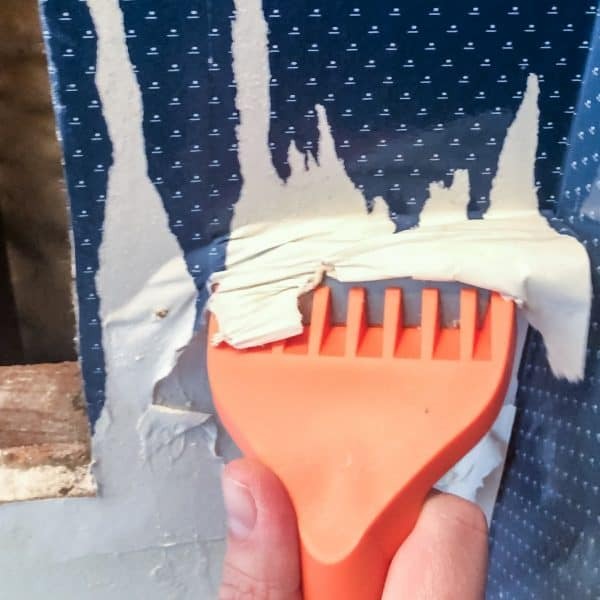 I used a wall scraper to remove the leftover adhesive. I’ll repair the torn drywall paper with Zinsser Gardz Problem Surface Sealer so it will be ready for the new tile to be installed soon! Whew! What a week! 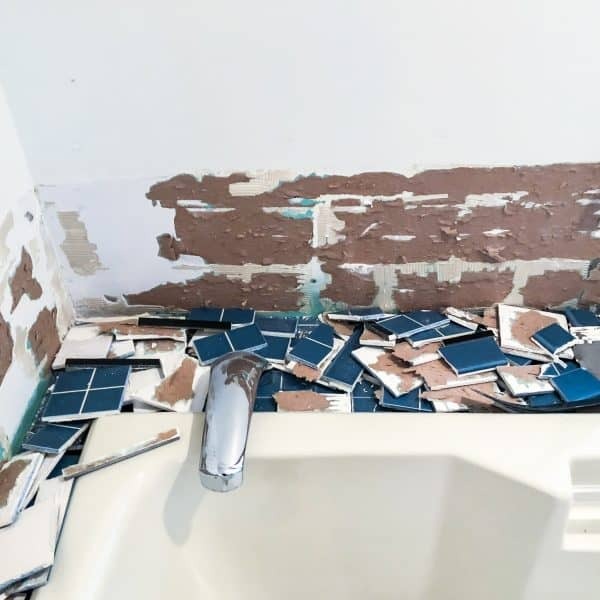 I’m relieved this DIY bathroom demolition didn’t take nearly as long as I expected. That means I can start making it pretty much sooner! 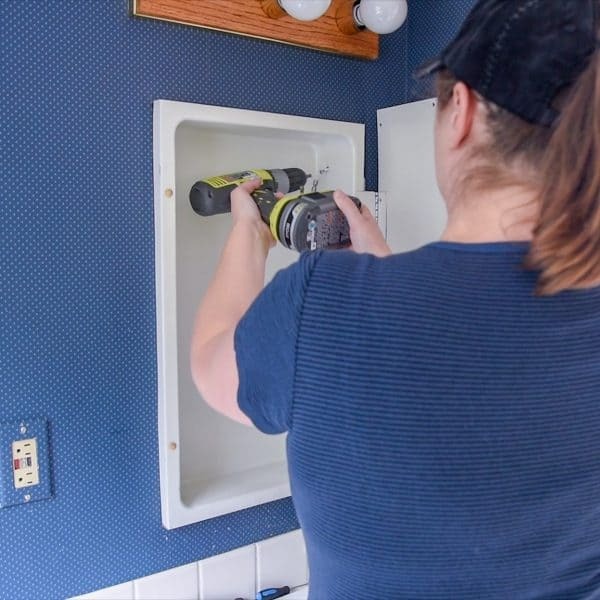 Make sure to head back here next week for the latest installment in my half bath remodel series, and check out all the other makeovers taking place over at the One Room Challenge! Wow! So much work! Looks great so far! Such a great improvement to update a bathroom! Thanks for sharing at Home Sweet Home! Oh this post has given me some great ideas for our new bathroom, it’s next on the list after our bedroom. Thanks for your great info.